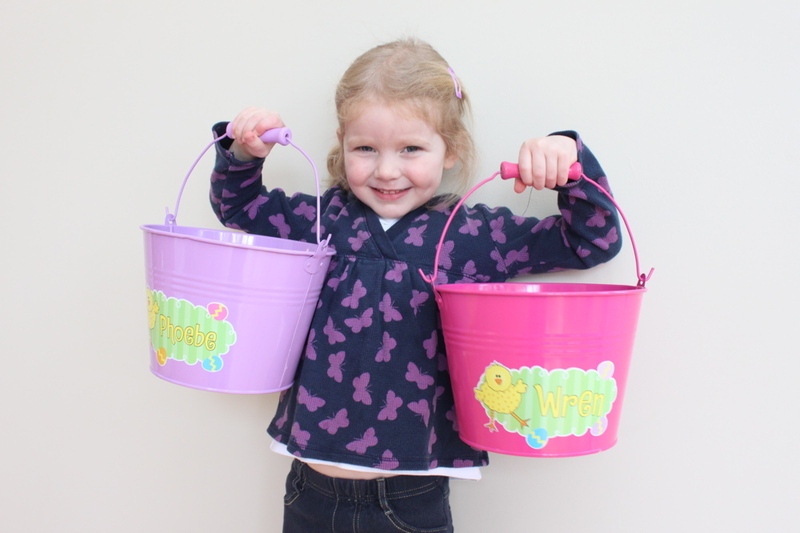 Thanks to the generous and thoughtful people at Personal Creations, the girls have personalized Easter buckets this year! It made my jaw drop when I realized Easter was 2.5 weeks away already, yikes. 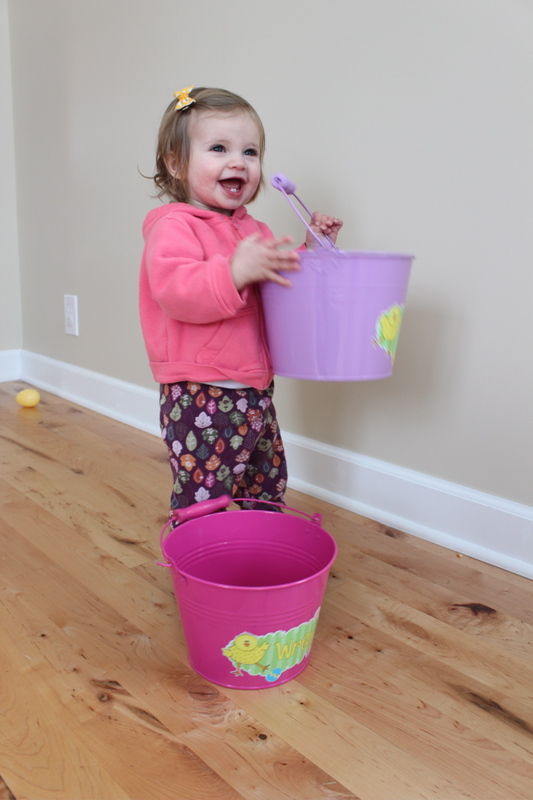 We have been getting a bit of our Easter on around here and the arrival of the buckets was the catalyst for some decorating and some crafting and some reading of my favorite Easter story. And A LOT of talk about the beloved magic seeds. We’re all wondering how they might grow in this still very snowy place though… hmmm. It just might be one of those snowsuit-over-the-Easter-dress years. So, these buckets! We’ve been playing a lot of games with them like throw the plastic Easter eggs in (Bozo the Clown style), balance a plastic Easter egg on a spoon from bucket to bucket and a lot of pretending to BE the Easter Bunny and filling the buckets. It’s fun to have something personalized, especially for Wren who is beginning to recognize and “read” more and more words and loves to see her name in print. It reminds me of something my grandparents might have given us because they gifted us with monogrammed or personalized things every once in a while. So “thank you!” again to Personal Creations for the lovely gifts. We planted Magic Seeds with Wren last Easter and she talked about the suckers growing from the ground all year. We borrowed this tradition from my sister-in-law’s family and it’s a huge hit. Simple and as it turns out, effective for boosting a spring lawn too! Give the kiddo a small bag of grass seed, aka Magic Seeds, and let her go at it. She flung Magic Seeds all over the lawn, but I mostly directed her to the bare areas. Last year our lawn really saw a difference and she loved the process; talk about instant gratification gardening… Needless to say, she was thrilled to do it again this year. It was a gorgeous Easter morning with a fresh blanket of dew, amidst bunches of sprouted suckers. Spring has sprung indeed! How was your Easter, lovelies? 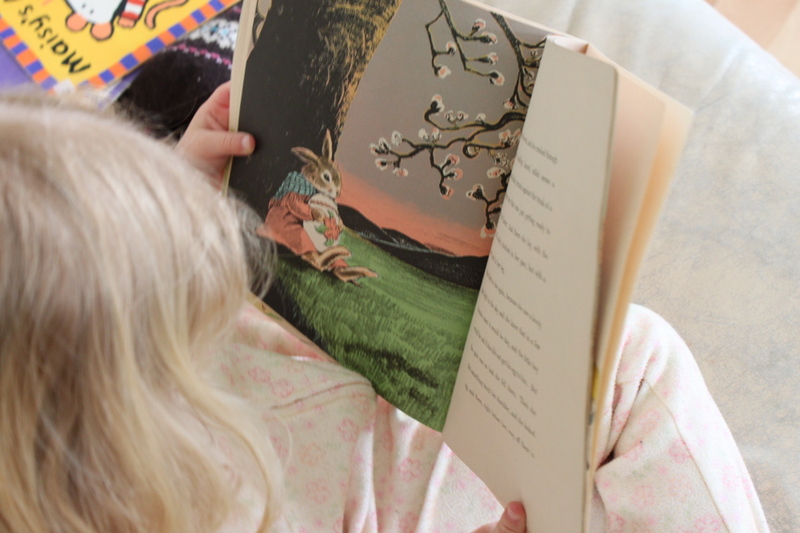 My very favorite Easter book–and one of the most meaningful children’s books at any time, really–is The Country Bunny and the Little Gold Shoes. I remember reading it as a child and loving the story and the illustrations. I was lucky enough to find a garage sale copy last year and I snatched it up for probably $.25. Such a great find! For the past week, we’ve read it about twice a day and Wren will often pick it up and “read” it herself. It’s such an inspiring story for children and as a Mom I’m also getting a whole new level of meaning out of it. It’s quite a timeless feminist story, but it’s still hard to believe it was written in 1939! Have you read it? If you haven’t, you should pick it up. The basic story is of a female bunny who wants to be one of the chosen Easter Bunnies, but is told that she’s just a brown country bunny and could never be chosen; all the chosen ones are white, male and strong. She goes on to brilliantly raise 21 bunnies of her own, teaching them each an important life skill like mending and sewing clothes, painting, singing, sweeping, cooking, washing dishes, and working in the garden. Her hard work, perseverance, diligence, and thoughtful bunny-rearing is rewarded in the end as she IS chosen to be one of the Easter Bunnies. I won’t spoil the rest of the story for you… but man, is that Mother Cottontail an inspiration! I tear up a bit when I read the story with my little bunnies too. What’s your favorite Easter story that you like to read with your bunnies? 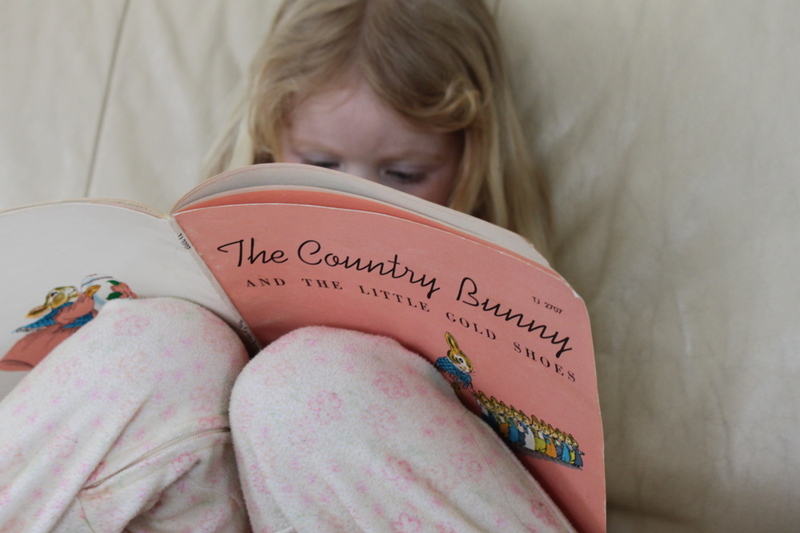 Click to purchase your copy of The Country Bunny and the Little Gold Shoes. Makes a GREAT gift too! We had such a wonderful Easter this year. It was sunny and felt so springy. New life! We spent most of the day outside when we weren’t eating one of our decadent meals or chomping on chocolate bunnies. The weekend was full of wonder for the little birdie (and us! ), beginning with a real bunny sighting in our backyard on Saturday morning. Bunny!!!! Another highlight: Peeps? This is really a food? I just love the expression on her face below. Classic. We also colored eggs this year using the simple McCormick food colors and the colors came out beautifully vibrant on the white eggs and deep and earthy on the brown eggs. It had never occurred to me that I could even use simple food coloring. Until I saw some beautiful pics over on Not Martha and wondered how she could achieve those amazing colors. Food coloring, duh! Last year I tried doing all-natural vegetable dyes and they came out all blah. Throw some “safe” chemicals at ’em and voila! Magic seeds! We started a new tradition this year that we borrowed from my sister-in-law’s family. The day before Easter we planted “magic seeds” all over the lawn. We used grass seed, as I had plenty on hand from my egg cup project. We checked on them several times over the course of the afternoon and evening and made sure to also say goodnight to them before bed. In the morning, we went outside to check on them and the seeds had bloomed (boom!!! says the birdie) into 200 Dum-Dum suckers! And a little costume change for the afternoon… a pretty little Easter dress. Piddy dess!!! Oh, and another sucker. That would probably be number 6 for the day? How was your Easter, lovelies? Full of hope, renewal and chocolate bunnies?! And a few sugar-fueled meltdowns to round out the day? What are some of your favorite Easter traditions? Will you send me a picture or a link, or share a story with my readers in the comments section? Please and thank you! Don’t you just love egg cups? I sure do. And I also enjoy soft-boiled eggs. AND I love the idea of eating the eggs in beautiful little cups. But I hardly ever eat an egg in one of our egg cups! So what’s a gal to do…? Turn them into little planters, of course! Lovelies, this is SO simple and rewarding. Bonus! Easy to do with your wee ones too. Have some potting soil, a bit of grass seed and a few cute little containers? You’re set. Want cups of grass for Easter? Let’s get growing! First fill up your containers almost to the top with the potting soil because this airy stuff settles a lot once watered and you’ll want the grass growing near the top, no? Sprinkle the grass seed in very liberally then dump in a bit more soil. Water the little guys and place them in a sunny spot. Then watch them grow! In less than a week, we had grass. I think it’s even time for a hair cut, don’t you think?